1. Remove the right inner fender (see page 20-290). 2. 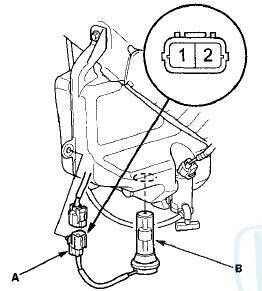 Disconnect the 2P connector (A) from the washer fluid level switch (B). 3. Remove the washer fluid level switch from the washer reservoir. NOTE: Fluid may flow out of the opening. 4. Check for continuity between terminals No. 1 and No. 2 in each float position. вЂў There should be continuity when the float is down. вЂў There should be no continuity when the float is up. 5. If the continuity is not as specified, replace the switch.